NETWORK FINALS: MACGYVER lost 0.1 in final numbers. In addition, FOX’s COLLEGE FOOTBALL game adjusted up to 1.0. CABLE HIGHLIGHTS: Discovery’s GOLD RUSH led Friday cable, up 0.09 to 0.64, with MASTER OF ARMS up 0.02 to 0.22. 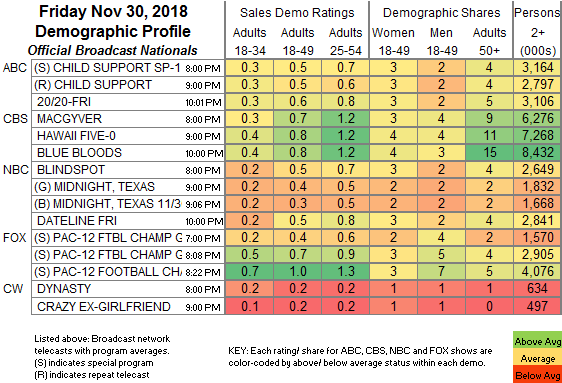 A&E’s LIVE PD gained 0.05 to 0.62, with the clip show lead-in down 0.01 to 0.31. ESPN’s NBA doubleheader was at 0.40/0.39. MTV’s RIDICULOUSNESS was at 0.33/0.31/0.26, and TOO STUPID TO DIE was at 0.19/0.15. Nickelodeon’s noon PAW PATROL was at 0.30. MSNBC’s RACHEL MADDOW SHOW led cable news at 0.26/0.40/3M, with Fox News’s THE FIVE at 0.24/0.37/2.5M, and CNN’s ANDERSON COOPER 360 at 0.22/0.29/1.3M. Adult Swim’s TENDER TOUCHES was at 0.25/0.23. HGTV’s MY LOTTERY DREAM HOUSE gained 0.02 to 0.25, HOUSE HUNTERS slipped 0.02 to 0.22, and HOUSE HUNTERS INTL was up 0.03 to 0.24. 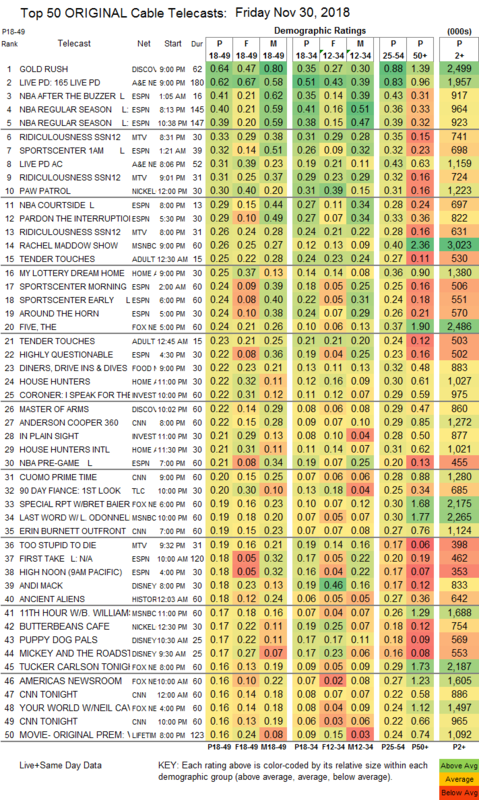 Food Network’s DINERS, DRIVE-INS & DIVES ticked up to 0.22. On ID, THE CORONER was at 0.20, and IN PLAIN SIGHT was at 0.21 compared to last week’s 0.28/0.27. On Syfy, Z NATION ticked up to 0.15, and VAN HELSING ticked down to 0.07. We’s LOVE AFTER LOCKUP was at 0.13. On Bravo, SWEET HOME rose 0.02 to 0.08, BUYING IT BLIND was at 0.07, and GET A ROOM held at 0.06. Paramount’s BELLATOR LIVE was at 0.07. HBO’s ROOM 104 was off the chart at 0.05/164K & 0.05/135K. Also off the chart: Cinemax’s TALES FROM THE TOUR at 0.03/94K.